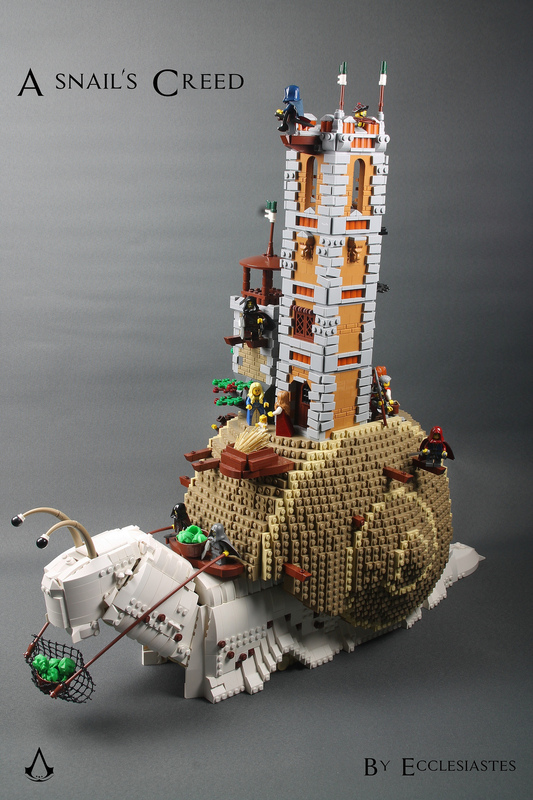 If you went to BrickWorld Chicago in 2016, you might remember seeing the amazing Eurobricks collaborative display called “Ready, set, escargot!” The display consisted of giant medieval-themed snails racing around a track. The template for these mammoth mollusks was designed by Mark Larson, while the structure on this snail’s back came from the mind of Marco den Besten. Marco drew inspiration from the Assassin’s Creed video game franchise, and I think his take on the idea would make for an interesting game. The rustic-looking towers complement the dark tan structure of the snail’s shell. Speaking of the shell, Marco has attached wooden posts to the sides for some classic platform gaming fun.